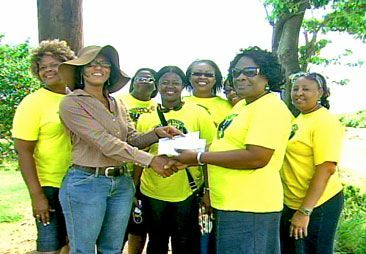 On Tuesday, eight members of the visiting United Vincie Cultural Group of Brooklyn, New York, took a detour from their mission, which involves donating medical supplies to rural clinics across St Vincent and the Grenadines, to make a special donation of US$2,000 to the Argyle International Airport. According to founder and president of the group, Dr Roxie Irish, most of the money was taken from the groupâs funds to add to cash donations received for the airport during one of their fundraising events in New York. Dr Irish also made an additional donation of US$300 dollars on behalf of the Irish-Bobb family, in memory of her grandmother Caryl Wiseman, who according to Irish, was a Vincentian patriot in every sense of the word. Dr Irish says they are happy to see an international airport for St Vincent and the Grenadines becoming a reality and they are happy to be a part of it. She says they are pleased with the progress being made with its construction and pledged the groupâs continued support for the construction of the airport, noting that it would ease the travel woes they experience at other regional airports enroute to SVG. Construction of the Argyle international airport is slated to be completed by the end of 2013, with operations to commence early to mid 2014. It is being constructed at a cost of EC$652 million.